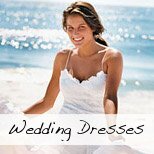 Your beach wedding ceremony whether held on an actual beach or in a chapel is the most important and sacred part of the entire wedding and should be as personal to you as your wedding gown. It should be a truly memorable occasion to both the bridal couple and their guests/witnesses. 1. Religious: This type of ceremony is dictated by the beliefs of a particular religion and is performed by a priest, minister, rabbi or other ordained official. 2. Interfaith: two representatives of each faith normally perform this type of ceremony when individuals of different faiths are married. If you do not want to use two different officials, then a non-denominational official is also an option. 3. Civil: This is generally a non-religious wedding (but can include some spiritual/religious texts) and is performed by a judge or registrar. 4. Spiritual: A spiritual ceremony places emphasis on humanistic and spiritual beliefs rather than religious beliefs. Before you start making any decisions about your beach wedding ceremony, meet with your chosen official/s. Be sure you have a rapport with him/her, and don't hesitate to keep looking till you find someone you can relate to and get on with. Ask him/her if they have a standard service that you can look at with your partner. Ask how long their standard service lasts. Ask how flexible they are if you would like to remove or add anything to the service. Are they willing to let you write your own vows? Do they need you to have marriage counseling before the ceremony? First things first; no matter where you would like to have your ceremony, make sure that your official is willing to conduct the ceremony in your chosen location, and that it would be legally binding. Many countries do not accept outdoor ceremonies as legal and you might need to repeat the legal part of the ceremony in an accepted location. You will also need to get special permission from the local government (in most cases) or parks board to use any local beach. 1. Insist on having a rehearsal prior to your ceremony. Go through each person's positions and movements during the service with your official. This will save your wedding party from looking foolish if they don't know what they are doing and where they need to be standing. 2. Request for your musicians to be present at the rehearsal if at all possible. Also find out what they are planning to wear. Many church choirs do not have the funds for an official uniform, so request that they all wear something similar, or even if they could tie into your theme at all. 3. Speak to your official if you would like to have your service videotaped. Some of them might ask a fee for this and many churches and chapels do not allow it. 4. Never let your guests enter a space that is silent. Ask your chosen musicians/DJ to play something appropriate as your guests take their seats. 5. 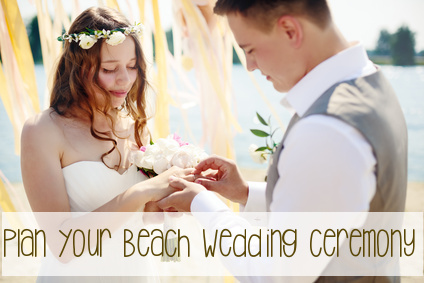 Include a notice in your order of service about anyone that will be taking part in your beach wedding ceremony, even if it is just to mention that they are your brother, your best friend or your fiancé’s aunt! You may also include something about the history of the chapel or the significance of the specific beach you chose or anything else you think your guests might appreciate to read while waiting for you. 6. Ask your musicians to keep playing for a little while till you and your guests have departed for the reception venue.